One day the Singularity would elevate humans to cybernetic superbeings, and maybe then people would say what they meant. Probably not, though. I loved this tale of when magic and science collide, full of humour, love and commentary on our modern life. It’s the second book to have a non-humanoid AI that made me cry too. The story starts with two teenagers, both on the outskirts of school society who become tentative friends. Laurence loves nothing more than spending his life in front of a screen. He built a time machine that can send him two seconds into the future and is now building a supercomputer in his wardrobe but his parents keep sending him to outdoorsy things. So he pays Patricia to lie to his parents that he’s been outdoors. He had conquered a small piece of time, and they were conquering a small piece of space. They understood, as he did, that this was a down payment. Patricia loves nature but her parents would rather lock her away in her room. Her sister is possibly evil. One night, after her sister douses her dinner with an excessive amount of spices, Patricia leaves her body and talks to a bird named Dirrp who takes her to the Parliament of Birds. There she discovers she’s a witch and is asked a question she doesn’t answer. Yet years pass, and magic seems to have left her. Once thing I particularly liked was how these characters do grow up. It wouldn’t have been the same book if it stayed with their childhoods. Their families seem cruel, or at best negligent, but when all is said and done, there was love there. As the characters grow up they can see their childhood with hindsight, just as we all start to see our parents differently with a bit of distance in time and space. The book is told in different parts, each at a different point in their lives, giving more scope to the story. We don't need better emotional communication from machines. We need people to have more empathy. When Laurence and Patricia meet again, they are both living in San Francisco. This gives Charlie the chance to incorporate hipsters and start-ups into the mix, giving a zeitgeist feel despite being set in the near future. It also deals with climate change, the awful tragedy of natural disasters and questions whether or not it is inevitable. Magic is a symbol of nature; can science and nature cohabit peacefully? Of course Patricia is on the side of magic and Laurence science, but their friendship is stronger than that. They might fall out, but they are mysteriously drawn back to each other. They have to make tough decisions and sacrifices as the world falls apart around them. In the end, it would seem that magic and science aren’t all that different after all. How do you ever know your own emotions are spontaneous and genuine, and not just a programmed set of responses? I loved the assassin slash guidance counsellor as well. Just a great cast of characters with charm and emotion and a bit of satire on what technology has done to us. I could waffle on forever but I really should leave some of it for you to discover by yourself. It gets a big thumbs up from me. Plus, the cover is gorgeous. 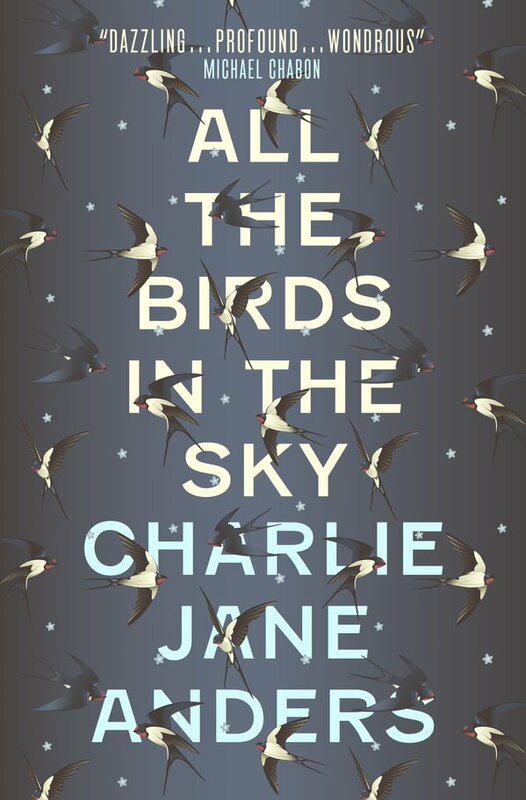 All the Birds in the Sky is published by Titan Books and is available in paperback and ebook editions from 26th January 2016. Thanks go to the publisher for providing a copy for review. 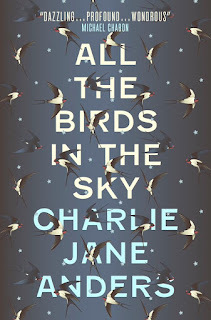 Charlie Jane Anders is the editor of io9 and this is her debut novel. I've seen this around a lot over the past couple of weeks and it sounds really great. I love the idea of science v magic and old friends being on "opposite" sides. Definitely going to keep an eye out in Waterstones! Magic AND science. Witches and the Singularity. That sounds like nothing I've come across before! I love that quote about empathy. Sounds good. Nice to see another blogger recommending this one! Though not what I might consider to be in my wheelhouse I thought it looked like one I would like. Thanks for the review!